Drive until Forcalquier then take the D16. 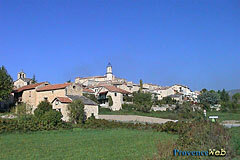 Sigonce is a superb little village situated 9 km from Forcalquier. Small shady squares filled with colourful flowers, old stone houses tastefully restored... a magnificent natural environment in the background which offers some delightful walks... you will rapidly be seduced by the charm and peaceful atmosphere that reigns at Sigonce. On the outskirts of the village, you will see the St Claude church that dates back to the 14th and 15th century, with its particularly original stone-tiled roof or "toit de lauze". Opposite the church, you cannot miss the old flour windmill with its miller on the sign outside. 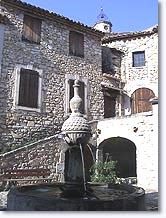 While strolling in the village streets, you can admire the beautiful old houses and on the main road you will come across several fountains, communal washing areas and oratories. 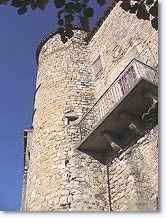 You can climb the street leading to the top of the village and admire the outside of the "château de Bel Air" (private property). This wonderful 17th century residence is undergoing major restoration. 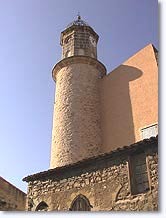 14th and 16th century "Eglise de St Claude". Lurs (6km), Fontienne (7km), Forcalquier (9km), Revest Saint Martin (9km).